I did not remove the mace- Senator Omo-Agege – Royal Times of Nigeria. 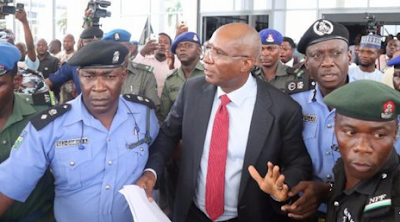 Senator Ovie Omo-Agege who was arrested by the police over his alleged role in the invasion of the Senate Chamber has released a statement after being released by the police. The statement confirmed that the Delta Central senator left the police after telling the police what he know on the invasion of the senate and removal of the mace. “On Thursday, April 12, 2018, the Senate purportedly suspended Senator Ovie Omo-Agege. However, based on legal advice and his understanding of the current position of the law, Senator Omo-Agege today resumed work and sitting with his colleagues. “A few champions of the unconstitutional, invalid and tyrannical suspension tried to stop him but those who opposed it welcomed and protected him throughout the sitting. We are grateful to the many distinguished senators who stood by Senator Omo-Agege. “We are aware of several media reports suggesting that Senator Omo-Agege personally removed or encouraged anyone to remove the Mace of the Senate. This weighty allegation is not true at all. “We are also aware of a statement allegedly issued by the Senate Spokesperson, Senator Abdullahi Sabi. Without any investigation, Senator Sabi willfully, deliberately and unfairly made very serious allegations against Senator Omo-Agege on the Mace incident. We are carefully studying Senator Sabi’s allegations to ascertain their full ramifications. Appropriate responses will follow, as may be necessary”.